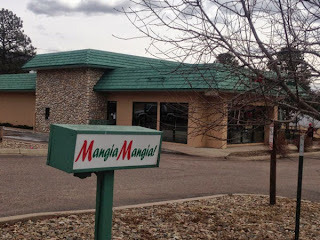 In this Kitchen Nightmares episode, Chef Gordon Ramsay visits Mangia Mangia in Woodland Park, Colorado, bought by owner Julie Watson, who just wanted to own a restaurant and chose to make the restaurant an Italian restaurant to stand out. Arriving at the restaurant Gordon pulls into the drive thru and is confused that a restaurant offers this service. Gordon orders the soup of the day, Janelle forgets to give him a spoon and the soup is a solid sludge. Gordon orders mushroom ravioli, veal piccata, salmon, lasagna and spaghetti and meatballs. The ravioli is bought in with a terrible glowing white sauce, the lasagna is still frozen in the middle, the meatballs taste like "warm foam", the veal is raw in the middle and the balsamic drenched salmon tastes frozen. Gordon confronts the staff in the kitchen and discovers that none of the staff have any formal training. Julie is defensive about the food, telling Gordon the food is good. Gordon walks out and Julie bursts into tears. Gordon returns for a dinner service and it is a disaster, most of the food is returned to the kitchen but is thrown away. Gordon decides it is time to inspect the walk in and finds 400 portions of pre-cooked pasta. The staff reveal that the cooks change the breadcrumbs every other day, coating both egg plant and chicken. Frustrated, Gordon walks into the dining room and explains that only 5% of the food they were served is fresh. Julie walks out, the service stops and the staff go out back to smoke and moan. Janelle tells Gordon that Trevor tried to punch her at work, the staff don't always turn up for shifts and Kevin and Trevor have both often come to work high. The next day, it emerges that Trevor has a meth problem so Julie fires him. He recruits Chef Don to run the kitchen and hosts a family fun day to advertise the restaurant. The restaurant decor is given a makeover and menu is changed with freshly prepared food on the menu. For relaunch night, things get off to a bad start when Julie fires quickly orders at the kitchen and is told to slow down as the fresh food takes longer to cook. The customers are impressed with the new décor and also with the food, the staff are also much happier in the restaurant. As a final prank, Gordon pulls into the drive through to pick up the microwave from the kitchen. Reviews were mostly excellent on both Yelp and on Trip Advisor after Gordon's makeover and the filming of the episode with compliments on the food and service. It appears they kept most if not all of Gordon's changes and followed his advice. However, Mangia Mangia closed in November 2014. Mangia Mangia was aired on 25 April 2014, the episode was filmed in August 2013 and is Kitchen Nightmares season 7 episode 5 and 6. I went to this place several months after Ramsey came and this restaurant was just par. Pretty much forgettable after eating there. I've tried the other Colorado Kitchen Nightmare place and it's excellent. I would recommend Pantaleones to anybody who wants to try one of Ramsey's successes. ... and BBC America ... I'm watching it on BBCA now! Today is July 9, 2015 and they just finished airing part 2 of the episode. I'm trying to find out why they closed, other than the fact that the owner was on the other side of crazy and her daughter had more than her share of issues as well. If they were the only Italian restaurant in the area, one would think that with Ramsay's help and the positive reviews afterwords, they could have made it. Personally, I would have changed the name to something more recognizable in an Italian theme because not many people are probably aware of what "Mangia, Mangia" even means, let alone know that it's Italian for Eat, Eat. Something simple like "Mario's" or "Luigi's" to convey the Italian theme to the locals who had been there and had a negative experience might have helped. I know how trivial that sounds, but a name, good or bad, can affect a business for a long time. I feel bad for the people who lost their jobs, but the owner's attitude and possible mental health were not conducive to a successful business. The daugher is so obnoxious. Ugh. Yeah. Whilst she certainly had her reasons (Who wouldn't be enraged at working with a disrespectful drug-addicted incompetent who tried to assault you), she's hardly any more competent, constantly whines and seems to defend her mother more than she should. I actually rather liked the daughter, Janelle - considering the stock that she came from. That mother/owner Julie was clueless and in full denial. I'm guessing they both suffer from bad taste in men, as well as poor taste in food. Dating Trevor was clearly a poor decision, and one that she will hopefully learn from. Janelle's overflowing emotions were perfectly understandale, considering the stress of running a failing restaurant and being abused by the nutjob ex-BF chef on a daily basis. Trevor atleast had the balls to admit his mistakes. The mom and daughter never admitted to anything. It was never the mom or daughters fault according to them. I agree! I felt like the owner was using him as a scapegoat because it was an easy out. Blame the junkie, can him, then turn things around and no one will realize the problem with the owner! I was honestly surprised that they didn't give a follow up on what happened to Trevor, and also surprised that Gordon Ramsey didn't take more time in a double episode to address the issue. I love the confusion over 550 grams of flour. Is it just me or does Julie remind you of a female version of Alan Love from the Loves Fish UK episode in both her mannerisms and way of speaking? I was really worried for Trevor as well. I would love to hear from a local that he found a better place to work and didn't turn to drugs after getting fired in such a humiliating way!!!! For those, like me, asking about how Trevor is doing, I found this FB link where supposedly his dad left a comment on the post. It is from 2014 tho. According to the comment, Trevor went to rehab, followed by drug-free maintenance outside, and then at the time is looking into going to culinary school. This is wonderful! I hope he continues to do well. Addiction is a scary road and without support and love it can be difficult. I wish him and his future the best. Thank you for providing this info. I was searching for the same thing! Ah, good news from this mess! Janelle said in that show that Trevor had been on for like 3 years. I didnt hear how long he worked there or when they went out or whatever be he clearly had drug issues long before working there. I mean i m all for giving someone a second chance in life or whatever. But, the society today needs to stop with all this blame everyone else for your on personal choices. Awww... they were mean to the poor guy. Let, me tell you this is that guy ever even thought about hitting my daughter.... mean? i would beat the brakes off the kid. Grow up people take reasonably for your own bad choices. I felt sorry for Trevor - he was used as the perfect scapegoat.